There’s some confusion when we talk about gym mats. What are they? What aren’t they? 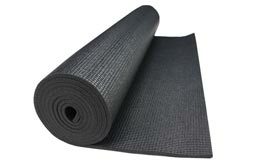 The truth is, there are a lot of gym mats out there: foam mats, rubber mats, horse stall mats, and much more. In order to pick the perfect gym mat for your unique purpose, we’ll need to go over each of your options. Whether you’re tumbling, or doing yoga, you’ll find there’s a perfect and affordable gym mat out there for you. 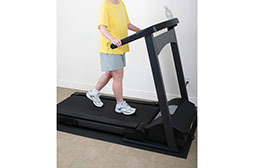 Floor exercises and mats under treadmills or stationary bikes. Best for higher impact exercises and moderate weight training. Olympic weightlifting and all other exercises. They’re easy enough to install. Simply place where you want them, and go. 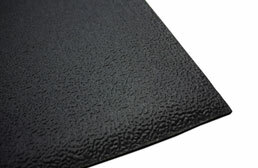 Some of our rubber mats come as rubber tiles. These are locked together like a puzzle. These mats can be heavy, so they’re not going to shift around while you move, either! 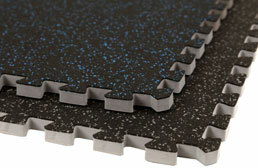 If you’re looking for something that’s versatile and durable, rubber mats are the way to go. Light to medium exercises. Beginning gymnastic moves. Basic cheer moves. Low to high impact workouts. Intermediate gymnastics, martial arts, and other tumbling moves. Low to high impact workouts. Advanced gymnastics, cheer, and other tumbling moves. Low to high impact workouts. Advanced gymnastics, cheer, and other tumbling moves. Landing mats. Keep in mind, foam products can be more prone to dents and punctures, so be careful not to wear heels or use any other sharp objects around foam mats. We already talked a little bit about cheer mats in the foam flooring section, but let me spend some time talking about what makes cheer mats different than other exercise mats. 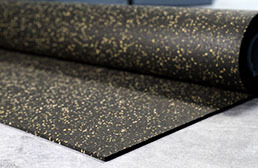 Cheer mats typically have a carpet top, much like professional cheer and gymnastics competition flooring. 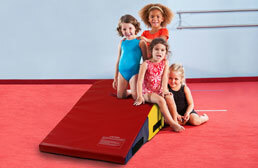 These mats are shock absorbent enough for cheer and gymnastics advanced moves. 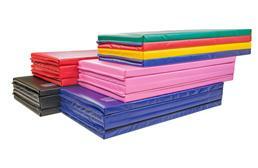 Cheer mats also tend to be portable and can easily be rolled up and stored as needed. 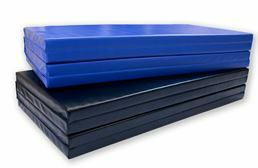 Folding and tumbling mats are vinyl encased mats that are popular for tumbling, martial arts and wrestling. 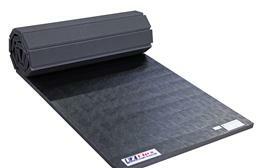 These mats are very shock absorbent and can be easily folded up and stored or transported. 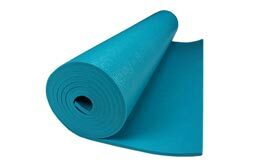 Since these gym mats are encased in vinyl, they are very easy to clean and sanitize. They also aren’t usually punctured by heels or other sharp objects. 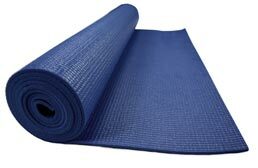 What are people usually looking for in a fitness mat? Probably if it’s transportable, easy to care for and durable. Our fitness mats are typically all three. 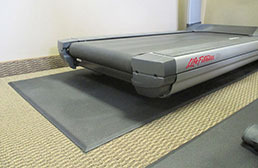 Fitness mats are thicker than yoga mats and provide more comfort for more difficult floor exercises. These gym mats come in different types, but are typically light and easy to store. 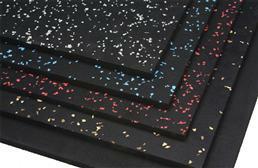 They can have vinyl tops, be encased in vinyl, or have rubber or foam for durability. These mats are also super easy to clean and sanitize. If you need a custom sized practice area for whatever skill you’re perfecting, you probably want our interlocking foam gym mats. 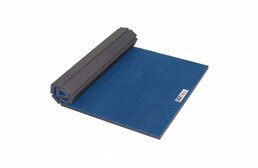 These mats are thick and offer excellent shock absorbency. 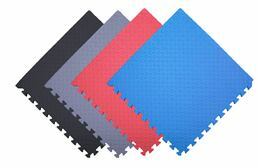 These foam mats are commonly used as flooring for MMA, Judo, Ju Jitsu, and other high impact exercises. Are they right for your sport? Check the chart above! 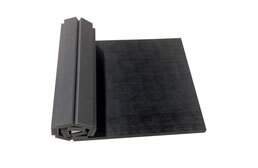 Made of closed cell EVA foam, these tiles are resistant to water, mold and mildew growth. These interlocking foam tiles are a DIYers dream and can be cleaned easily with a broom, mop or rag. 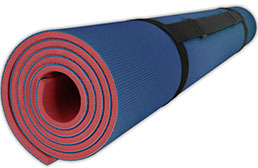 Our yoga mats are better than the cheap thin mats you get at local department stores. Available from ⅛” thick to ⅜” thick, these yoga mats will provide you with a safe, comfortable space to practice on. 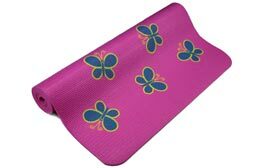 Our yoga mats are available in many colors and sizes and come in PVC, rubber, cork, and foam. All of these mats are very easy to clean, maintain and sanitize, and are non porous.